The necklace has a mini elastic band as a pendant. The chain and the band are made of 925 silver. The highest quality silver possible. Martine Viergever brings out the hidden beauty in everyday objects. Viergever is inspired by bits and pieces from everyday life and used this as her starting point for this design. The necklace has a mini elastic band as a pendant. Only the elastic band is no longer rubber, but 925 Sterling silver. Martine Viergever brings out the hidden beauty in everyday objects. This piece of jewellery has a robust and natural appearance, which combines well with various outfits. The design goes well with today's fashion trends, where we are once again are seeing minimalist accessories. Are you looking for jewellery that holds a special meaning or brings back memories and catches the eye? 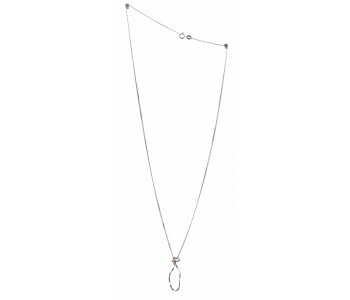 The unusual pendant sets this silver necklace apart. Using the same rubber band as the basis, Martine Viergever has also created a bracelet. A lovely gift for yourself or to give as a present. The necklace with pendant and bracelet are delivered in an attractive box.